My sister and her kids are up with my mom for a vacation. So this morning I decided to go for a walk with the 13 year-old twins and our three dogs. "Can you show me where the blueberries are?" they asked. "Sure. " I said. "They are on top of the hill." I have a road that goes back about a quarter mile and then cuts up to the top of my hill. From the top of the hill you can see a lot of the mountains surrounding us this is one of my favorite places. We have a lot of berries on our property: blackberries, raspberries, and wild blueberries(which are called huckleberries locally). I pointed out the red raspberries and several of them were ripe as well as a few blueberries we found on the side of the hill. So we picked and ate them all the way up to the top and just when I was pointing out a large patch of blueberries. I saw what no one wants to see about 50 yards in front of me. A large black bear also eating the berries. I shouted to Scooter who was a head of me and the bear bolted. Too late Scooter was in pursuit. Now the girls made a bit of a sound and Leo charged and growled, but I had him on a leash so I was able to keep him from also entering the charge. The Chihuahua was quickly scooped up by one of the girls. Then three small heads popped up...cubs! Now I was worried. I turned everyone around and started them down the hill yelling again for Scooter hoping he had not caught up with the mother. I realized I could do nothing to help Scooter if he didn't stop on his own. For everyone safety I needed to get everyone away from the cubs. I moved them back down the hill away from the cubs and I saw Scooter coming back to us just as the mother bear stood up over six-foot tall a distance from the cubs ready to share her feelings with anyone coming closer. Thanks goodness we only have black bears and not grizzlies or we would have all been attacked. The bear let us move back down the mountain with a story I am sure the twins will remember for a while. As they were saying they weren't that scared and weren't the cubs cute my heart was still beating at a fast rate thinking about how close we came to someone or a dog getting seriously hurt. 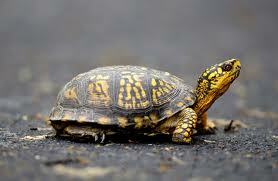 I have been seeing several Eastern Box Turtles in the last couple days. Of course they are always crossing the road and I have to be careful not to crush them. The turtles are not endangered, but thier numbers are still quite small. They burrow into the dirt when temperatures get too cold for them which is much under 38 degrees. They go into a sort of hibernation until the weather warms up and food is available. I think lately they have been heading to the creek to cool off as it has been unbearably hot. The temperatures have been in the 90's with about the same humidity. We have been working early and stopping by 1:30pm as it becomes hard to breathe and work. Last year I got way too much heat and I am not about to repeat that event. I didn't feel good for 2 or 3 days after. 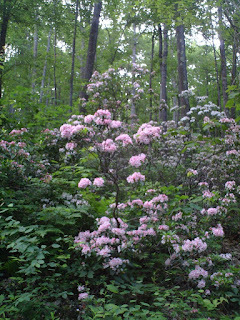 When it gets hot in the forest it is always humid. It is sort of like living inside a terrarium. Between the rain and the heat we are trying to get some outdoor painting jobs done. It is a difficult task at best. The grass is still growing at a good rate even with the high temperatures due to the rain included with the heat. Everyone has been staying as close to the creek as possible in tubes, canoes, kayaks or just sitting in a lawn chair in the middle of it. The warm temperatures have slowed down the fishing as the temperature of Pine Creek is approaching 70 degrees according to Tom Finkbinder who runs Slate Run General Store and is an Orvis dealer. The dogs pretty much stay indoors or in the creek trying to keep cool as well. So if you come to camp bring a variety of clothes. You never know when we can go from hot back to cool. I would prefer a little cool right now. Mountain girl, Paula, logging out. Here is a picture and video from the Morris Rattlesnake Festival. All snakes are caught and released after being microchiped, weighed and measured. Prizes are awarded for longest Black Rattler, Yellow Rattler and overall longest. This guy was about 48" long, usually the winner is over 50". There are lots of vendors at this event all sorts of bad things to eat. Also they have a softball tournament going the same day. All money raised goes to the Morris Township Volunteer Fire Department. From the looks of things they should do well this weekend. We always go to eat bad and buy the latest Rattlesnake T-Shirt. This is what I am calling, "Bear Soup." 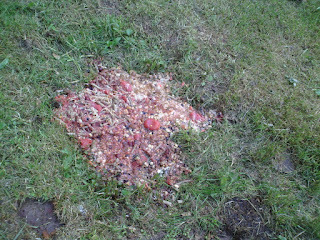 This mess came about when I was asked to dispose of about 50 cans of old, outdated food. The cans are heavy when they are full of food, so I thought why not dump them out and then I just have light cans to get rid of. It is 25 miles to the dump so light and compressed is always better. 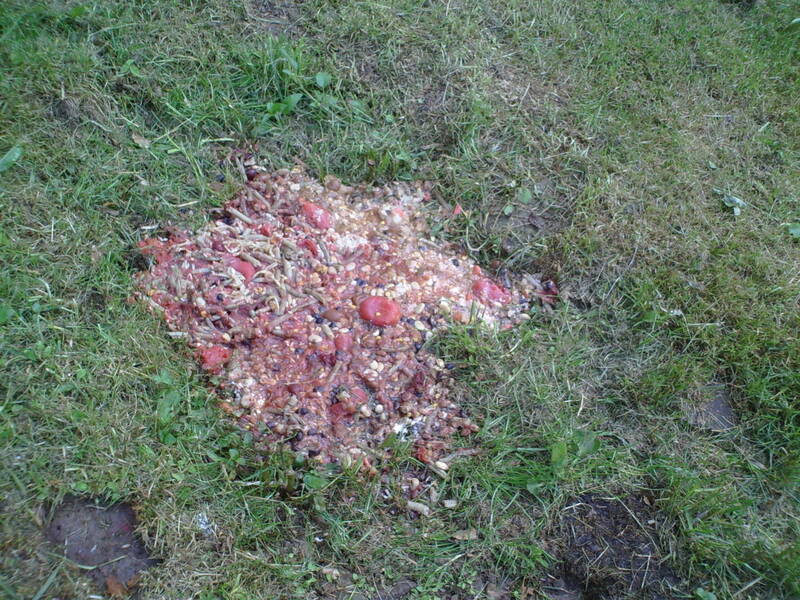 Well, I never imagined that combining things like: cream of mushroom soup, pineapple, chicken soup, tomatoes, beans, gravy,pickles, and cherry pie filling could be so ugly and make you not want to eat for days. With only half of the cans empty I filled a large trash container half full with this soupy mix. I wasn't about to bring this anywhere near my house so I found a nice one foot deep hole by the edge of the woods and left it. I am guessing it won't last long. Hope we don't have a sick bear staggering through the woods after eating this Bear Soup. 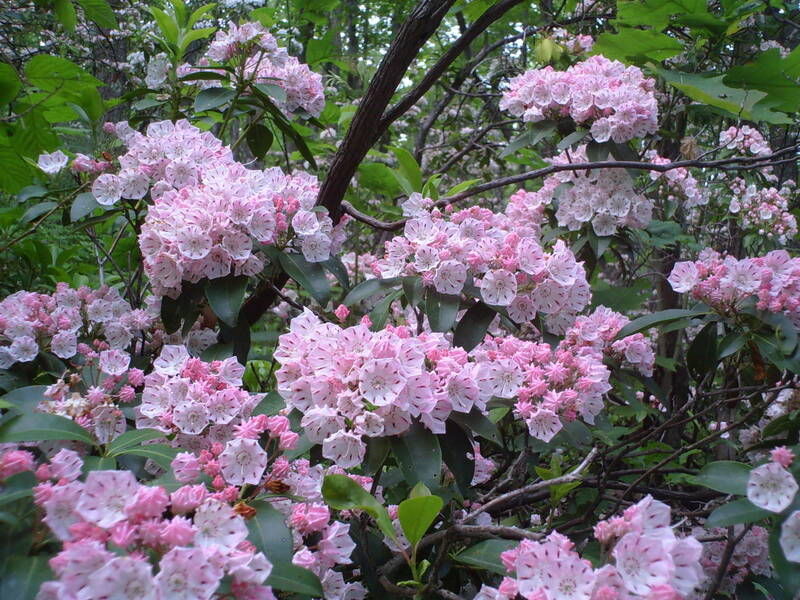 On a much prettier note I took a few pictures of the Mountain Laurel blooming on top of Cedar Mountain. I didn't want to leave you with such a bad image. So dwell on these last two pictures. Heading to Rattlesnake Roundup tomorrow in Morris. Mountain girl, Paula, logging out. Just got an email from a camp owner who has spotted "Snaggle Nose", the bear who about three years ago lost half his face in a bad fight. He is now closing on 600lbs. This big guy looks very mean with his permanent snarl look from his injury. So keep your camera ready and get a 2012 picture of him if you can and send it to me. The mountain laurel is blooming great on Cedar Mountain and is quite beautiful. Looks like it may warm up for the Rattlesnake Festival in Morris, which is good news for the snake hunters. Most of the snakes have been hiding during the cold spell we have had last week and the warm sun will bring them out to warm up. I will be getting some pictures to share. Mountain girl, Paula, logging out. 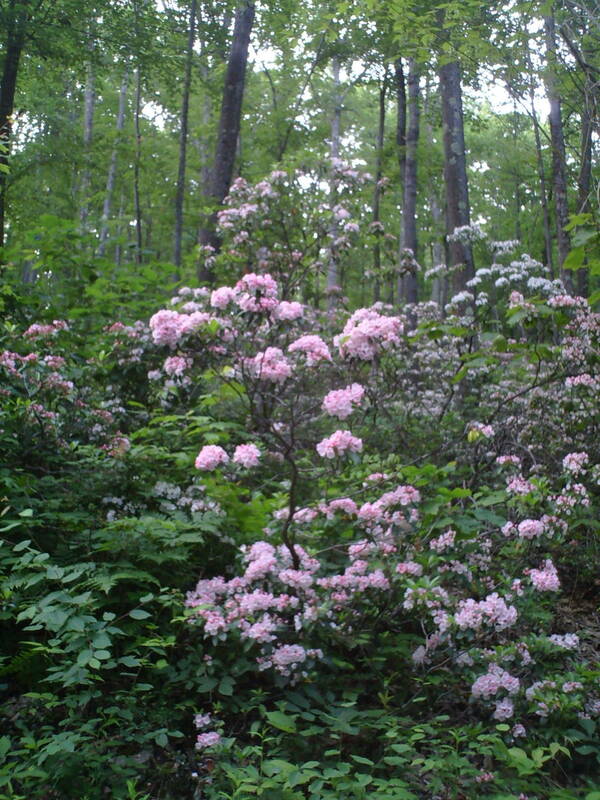 The mountain laurel is starting to bloom early this year and it looks like there is going to be a lot of it. I am thinking the warm winter helped with the health of the plants. We have been getting a lot of rain on and off, which isn't good for all the outdoor painting jobs we have this summer. Hopefully, we will get some dry spells to get a few things done. I had a call from Slate Run store today, Deb said a white cat was spotted up West Rim Road at a cabin just West of Fahneystock intersection. She said someone lost a cat camping last year in this area and wondered if this might be the same cat. The cat is now wild and hard to approach. So if anyone out there lost their cat contact me and I will give you specific directions. Just got back from taking the dogs for a quick walk between storms and after I spotted a large bear in front of house heading towards Hooke's camp. We went the other way and the dogs had their hair up most the way. They don't like bears much and the bears feel the same. Mountain girl, Paula, logging out. P.S. The bear came back to our house and he is a big one 4-5 hundred pounds. I heard a sound around 8pm near the porch. It sounded like a bird hitting the window. It wasn't it was Mr. bear who I have now nicknamed, "Trouble", gently unhooking a hummingbird feeder. I leaned out the door and yelled loud at the bear only 8' away and he took off down the road. The dogs were growling behind me so I let them out in the fenced area to add some barking to the mix. Lee walked out and saw him down the road to Hooke's camp. She gave him the what for and he turned to look at her and then ran faster. You don't want to upset the hummingbird lady. LOL.